My big gripe with open-wheel race cars is that they are so far removed from any car that I would ever own, drive or interact with that they bear little relevance to my life. Which is why Subaru’s WRX STI Type RA was so cool: it started out as a normal STI that you or I could buy. But then Prodrive got their hands on it. 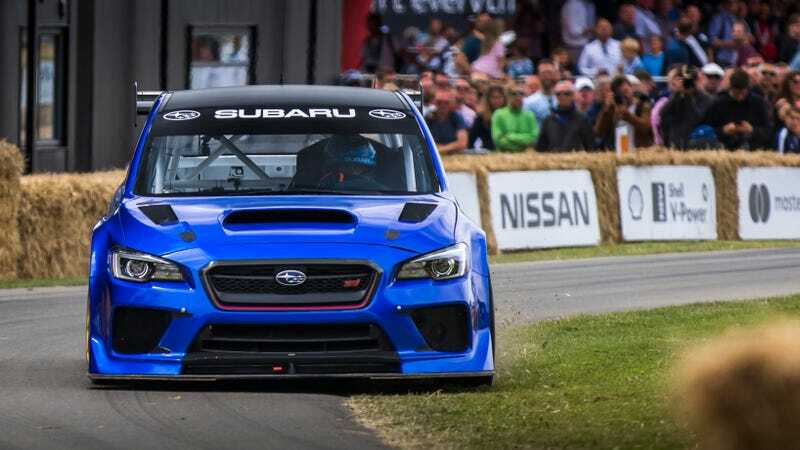 Last year, Subaru driver Mark Higgins set a record-breaking lap at the Isle of Man TT race. The record he broke? His own from a few years back. His car was then shipped back to Prodrive and reworked to be... better. Much better. We got to see it at the 2017 Goodwood Festival of Speed while engineer Richard Thompson gave us a thorough walkthrough. It’s built on the bones of a standard WRX STI, but with added goodies like fender flares, spoiler, diffuser and no mirrors. This gives it a strange, disembodied look as it’s hurtling across the track towards you. Inside, it’s completely stripped out and fitted with a safety cage built to current FIA regulations. There’s a six-speed semi-automatic transmission and a dry-sump system to help compensate for how much grip the tires produce. A new crankshaft, connecting rods and pistons were swapped in after the Isle of Mann run. The 2.0-liter engine is port-injected and makes 600 horsepower. The rear wing is manually adjustable up to 14 degrees and the whole car is brought to a stop with the help of eight-piston brake calipers up front. It is earth-shatteringly loud. In the video, you can see people standing nearby covering their ears while Thompson revved it. Higgins and his team were hoping to set a new record at the Goodwood Hillclimb. The time to beat was 41.6 seconds, which was set in 1999 by Nick Heidfeld in a McLaren Formula One car. Ultimately, Higgins and the Subaru came in third during the 2017 Festival of Speed Timed Shootout with a time of 48.25 seconds. First and second place went to Justin Law in a Jaguar XJR12D (46.13 seconds) and Jeremy Smith in a Penske-Chevrolet PC22 (46.22 seconds). But when you consider the fact that this ex-production car came in third behind some straight up race cars, the time is really impressive.